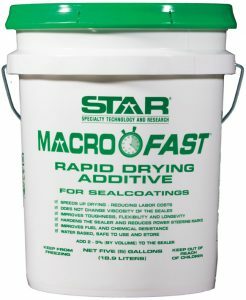 Speeds up drying of seal coatings there by reducing labor costs. Recommended for both refined coal tar and asphalt emulsion based seal coatings. 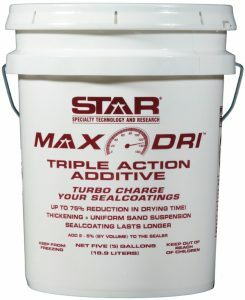 Hardens the seal coating and reduces power steering marks, scuffing and tearing. Makes seal coatings dry blacker and more uniformly under sun or shade. Improves tensile strength, flexibility and adhesion. 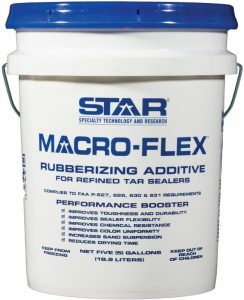 Improves fuel and chemical resistance. Water (latex) based; Water clean up. Safe to use and store. Polymeric latex additive for refined coal tar based seal coatings. Meets FAA P-627,628. Longer Lasting, Increased Toughness & Flexibility. Uniform charcoal black color upon drying. Capacity to suspend higher amounts of aggregate (sand, etc.) in the sealer mix design. Improved Gasoline, Oil and Chemicals Resistance. Works with BOTH Refined Coal Tar AND Asphalt Emulsion sealcoatings. Reduces Drying Time Up To 75%! 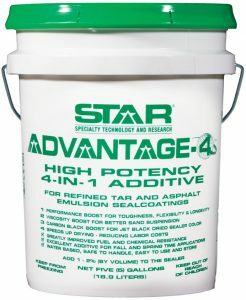 STAR Advantage 4 is recommended for all applications where a top quality sealcoating is a must. It is especially suited for improving the overall performance of sealcoatings. • Improves the overall performance of sealcoatings. • Thickens diluted sealer resulting in excellent and uniform sand suspension. • Built-in water repelling properties of cured sealcoatings. • Improves color – Sealcoatings dry to a uniform black color, under sun or shade. • Improves tensile strength, flexibility and adhesion. • Improves fuel and chemical resistance. • Polymer emulsion (water) based. Safe to use, store. Water clean up. • No health hazards reported.